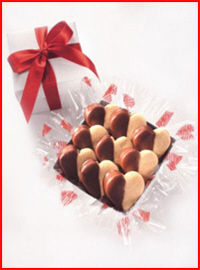 Sweet gifts for any occasion. Put a smile on their face with this sweet box. Includes our incredible chocolate chip cookies and rich fudge brownies PLUS Kit Kats, Hershey Chocolate Bars and Starburst. Toasty golden brown delectables in a white gift box complete with a beautiful ribbon.